After a moderately lucky bid on an auction, we've got our hands on a flight-cased 501 with no power supply. We paid very little and want to get it running and hopefully install in our studio (we have a Scorpion ii currently). Blue Dog power supplies in the UK will happily make us one but they don't know the PIN OUT on the power inputs, so can't make us up the missing cable, which we can't even find out what specific connector would be needed. I also had a couple of other questions for any 501 owners - ours has two power inputs, one that someone has sharpie'd "red" - does the 501 require two PSUs or is it for a redundant PSU? I've attached a pic. Any help to bring this desk back to life would be super appreciated! the big is very similar to the 501.. If a BIG console has two power ports on the back then one is for the console and the other for the automation/virtual dynamics. Amazing! Yeah, that would be fab if you could PM me a higher res one? I send you a better one in a minute. You dan also verify the pin out by opening the back and check the colors on the connector. 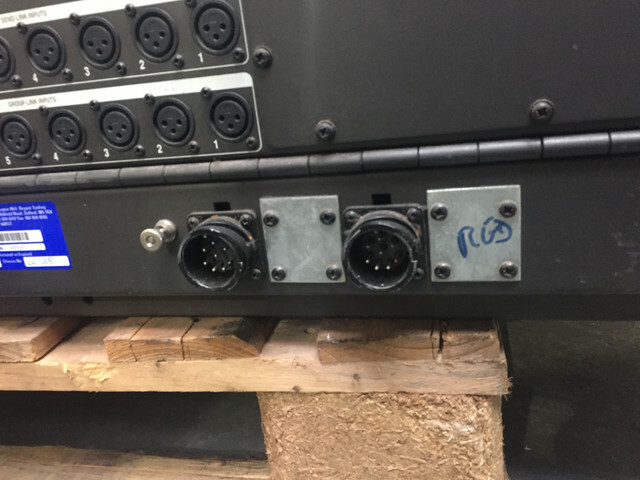 The 501 was designed with dual power connectors for redundant power supplies (which was done on the Recall and 501 because they were LIVE desks), but only requires 1 to operate fully. Someone has changed one of the connectors to accommodate a power supply with an 8 pin LITTON connector instead of the 19 pin LITTON which was standard. If a BIG has 2 power connectors, it came with (2) 850 supplies and was split inside as (1) 850 would not power a BIG(44). There should be a pinout for the 19 pin LITTON power connector in the 501 manual (available from AMS in the UK) and possibly a pinout for the 8 pin LITTON in a BIG manual. Sorry, manual from AML in the UK! !